The Classic Maya site of Cancuén in the Petén region of Guatemala was located by Teobert Maler in 1905. In 1967 an archaeological team from Harvard discovered the remains of a palace at Cancuén that, upon subsequent excavation, turned out to be the largest known palace structure in the Maya world, with over 170 rooms and 11 patios covering more than 25,000 square metres (Bower 2000). 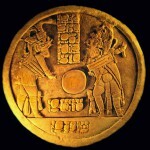 In 2003 a ballcourt marker (referred to as an ‘altar’ in the press) was looted from the site and then recovered through a partnership between Guatemalan authorities, archaeologists, and nearby communities (see Encyclopedia entry on the Cancuén Ballcourt Marker for more information about this object). Sometime before 1981 an extraordinary hieroglyphic panel was looted from Cancuén which was once part of a pair. The other panel is rumoured to have been lost or destroyed while it was being looted. 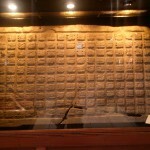 The surviving panel is now housed in a private museum in Guatemala (see the Encyclopedia entry on the Cancuén Panel for more information about this object). Bower, Bruce (2000), ‘Maya palace suddenly expands’, Science News, 158, 184.